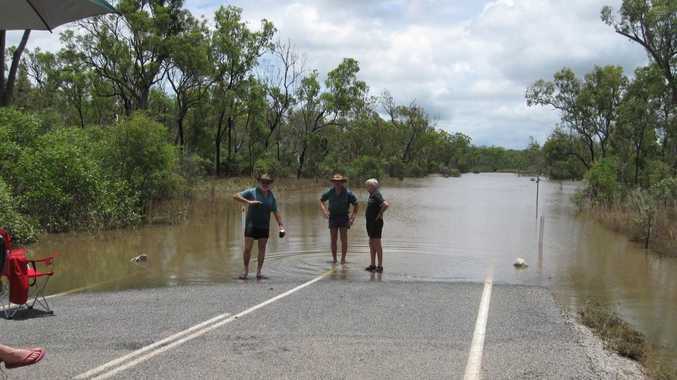 AWOONGA Dam has overflowed just twice in the past 11 years, but when it does frustrated Boyne Valley residents are stranded for days. Councillor Leo Neill-Ballantine told a Gladstone Regional Council meeting on Tuesday it was time something was done. "This is an unprecedented event in the whole Gladstone region, in the fact that it is a man-made flood," he said. The dam's walls were raised by 10 metres in 2002, and 2010 saw it peak with record inflows, cutting the Gladstone-Monto Rd for eight days. Residents have campaigned for the road to be upgraded and the meeting heard a partial solution. A motion was passed five to three (with Cr Matt Burnett absent) in favour of creating a detailed estimate aimed at building a 3km graded emergency bypass between Marsh and Nellie-Simpson Rd, which would run parallel with the train tracks. Mayor Gail Sellers, Cr Maxine Brushe and Cr Col Chapman voted against the motion and Cr Sellers highlighted the issue's complexity. "Firstly it is GAWB (Gladstone Area Water Board) land... secondly the road is a Main Roads (responsibility)," she said. "Third...across the region we have other places - Agnes Water with 7000 people... who have also experienced (flooding) difficulties." "We have the same in Baffle Creek, Lowmead. We have it in Raglan to the north Mt Larcom...Pikes Crossing." Cr Neill-Ballantine called on GAWB and the state's Department of Transport and Main Roads to forget past finger pointing and get on board with a solution. "There are 500 people living in the Boyne Valley who work at the Gladstone Port, the powerhouse, in agriculture and in industry," he said. The council's director of engineering services estimated a cost of about $400,000. If approved, the council will apply for state disaster mitigation funding. FRANK McKee calls the Boyne Valley the best place in the world. But he is furious that the Awoonga Dam "floods us into oblivion" whenever it overflows. "Not just once in ten bloody years; every damn time (it fills)," he said. Mr McKee has recorded 22 days the area has been cut off since 2010. "Over 70 people commute into Gladstone for work," he said. "It's hurting everybody. I know of one family who blew all their holiday pay to keep living." Mr McKee said the council's proposal didn't take into account crossings such as the one over Marble Creek. "I don't intend to quit until the situation is addressed," he said. "Not just with a substandard bush track to get us around the problem. That is great in the short term, but we deserve much better than that in the long run."